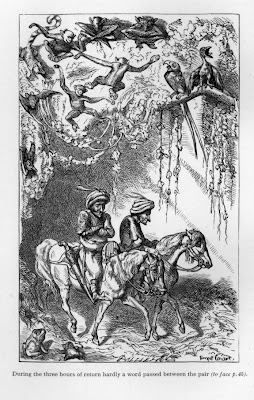 larry Latham has posted all thirty three of Ernest Griset's illustrations from Vikram and the Vampire, or Tales of Hindu Devilry. adapted by Captain Sir Richard Burton, 1870. If they take your fancy you can read this entire antique book online at burtonia.org in a pdf of a scanned copy of the original printing. Found via the wikipedia page on Burton. Sent looking by my pal dr jon. Here's the cover. 'an admirable and apparently inexhaustible draughtsman who possessed much satirical power and produced countless drawings in grotesque of animals and human savages, which wise collectors obtained for trivial sums at an untidy little shop near Leicester Square'. This shop was in Suffolk Street, and he had produced and sold sketches there from the mid 1860s. He contributed to the magazine Fun (which was similar in style to Punch) for some years, and the editor, Tom Hood, wrote verses for his drawings in Griset's grotesques, published in 1867. Mark Lemon, the editor of Punch invited him to join the staff in 1867, but he left after disagreements in 1869. Wonderful picture! I feel like I've only just started to find all the amazing illustrators of the last couple of hundred years. You and Jim Vadaboncoer are really helping to make a lot of these people known. The Guardian newspaper offices have an exhibition of 30 years of Posy Simmonds work, including a great selection from her Guardian Strip. They produced a nice book edition of these strips to give away, and I picked up a second copy (really I should have taken a swatch to sell on ebay a few months down the line but I'm not that mercantile). I'd happy to send you the spare if you'd like it. I can give you my email address for a PO box number if you're interested. yes, I must have that. how to contact you? How can us Yanks grab a copy of the Simmonds collection from the Guardian?? Directly from the Guardian? I knew I should have started a business with that. Why are the comments cut off on The Fate of the Artist-Vinnie Colletta article? I can't remember, but I would guess it was because too many silly bastards were giving me their opinion.